We love Bitcoin; we only created Storjcoin X because we had to. We are working on implementing features like sending data to an address, key-resource, etc., and it is not possible to implement these features on Bitcoin because of the metadata size limits. 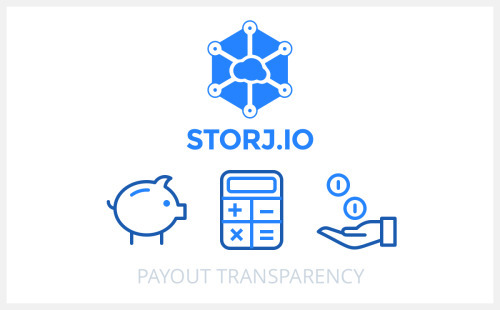 By using Storjcoin X we have some flexibility in terms of implementation. 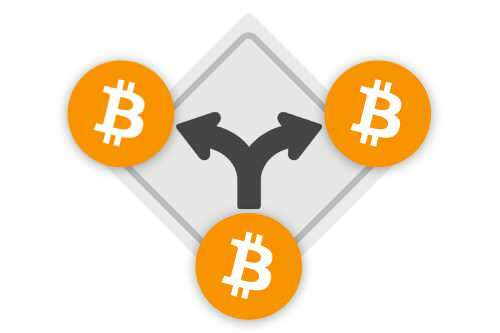 Unlike other cryptocurrencies, we plan to reintegrate with Bitcoin should treechains or sidechains become viable via a hard fork, but we are simply are not going to wait for it. Watch this simple one-minute video explainer for Storj. Pay only for what you use. No setup fees, no minimum usage. We are passionate about decentralization, and we love free and open source software. Our mission is to rethink cloud storage, to provide the security, privacy, and transparency it’s missing. That's why we are building an open-source cloud platform, that aim to fundamentally change the way people and devices own data. We welcome your feedback, bug reports, and pull requests. Do you want to join a team that is revolutionizing the world of cloud storage? If so, the Storj team would love to meet you! The coins will be created in advance in order to satisfy the demand of crowdsale participants. Any additional coins not sold in the crowdsale will be allocated to the developer pool, to be distributed to crowdsale participants through hard driving mining (also known as farming) or use in future crowdsales (decentralized Youtube, Imgur, etc. on Storj). Developers will not use these coins to dump for financial gain. Storj believes that that the devs should not rule the coin. After all, that's not decentralization, is it? We are trying something completely new by issuing a community pool equal to the developer pool. Any BTC in the community pool will be managed with Bitpay’s multi-signature Copay wallet. We will have to build a multi-signature wallet for SJCX. Funds will be managed by trusted community members who will listen to and act upon community proposals. This will be the first coin that allows the community to have equal power to the developers. Users will not “mine” the coins in a traditional way. 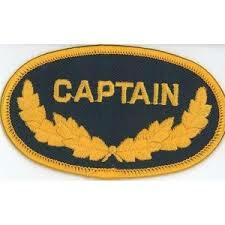 Instead, they will be compensated for providing their unused resources to the network via DriveMiner. This process will be simplified within the application. 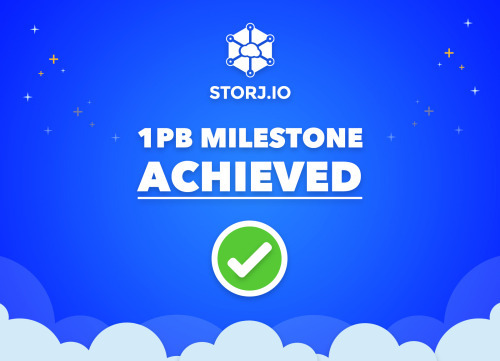 Today we are happy to announce we have reached a major milestone for Storj with 1 PB (1,000 TB) of data stored on our network! The total supply of available storage is around 3 PB, being supplied by ~4,700 farming clients. Even more impressive: most of this data has been uploaded since October 11th on the back of the v4.0 upgrade. Earlier this month at Venture Atlanta 2016, we announced our first Fortune 500 client, Cox Enterprises, an Atlanta-based communications conglomerate. We are hard at work to bring more customers to our platform, both by driving API users directly and by inking channel partnerships that can facilitate millions of users, like Heroku. More clients mean more storage supply needed to satisfy demand, which in turn will help fill up our farmers’ hard drives with data and their wallets with SJCX. Clients and farmers now report on file transfer performance via a system we call “exchange reports.” Reporting will help us identify inactive and poorly performing nodes quicker, which will help improve stability, performance, and reliability within our network. We are also re-architecting tunneling and data channels for our v6.0 release. This new architecture will enable a very exciting integration coming at the beginning of next year. No details yet; we don’t want to spoil the surprise! Stay tuned for exciting news and updates to come! Follow us on Twitter and join our Community on RocketChat at https://community.storj.io where you can meet the team, troubleshoot issues, discuss ideas, and socialize with other Storj fans! We recently announced a partnership with Heroku to make it easy for developers to use Storj’s distributed object storage. Heroku is a cloud platform that enables app developers to spend their time on application code rather than managing server infrastructure, and it’s one of the largest developer ecosystems in the world. 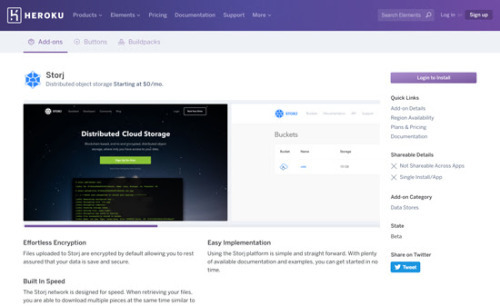 You can find the Storj add-on in Heroku’s Elements marketplace. 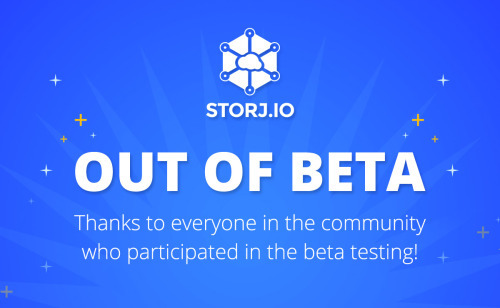 During the beta testing period, access to Storj will be free, just like in our current standalone product.We hope that Storj for Heroku makes our platform an easy choice for your next project. As always, your feedback is welcome – feel free to join the discussion and ask for technical support on our community chat. 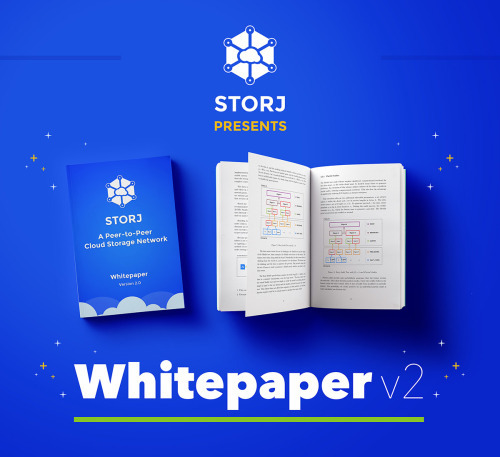 It’s been almost two years since the release of the first version of the Storj whitepaper, and the start of Storj. When it was released, Storj was only a theory, but now it’s a vibrant and robust network with over 1,500 TB of data stored and 8,500 TB of capacity and growing. The V2 whitepaper updates what worked, what didn’t work, and what will be built in the future. The time has come to put all of our technical knowhow into context and are very excited to announce the release of a revised Storj whitepaper on the morning of December 15th. This is exactly two years after the release of the first Storj whitepaper. We will also follow with a community hangout. December is also the time of the year when we reflect on our achievements and set the pace for the year to come. We will be hosting a Community Hangout to discuss recent developments, as well as keeping an eye on our near future plans and beyond. Everyone is invited to join, this is a great opportunity to ask your questions directly to the team. During the event you can submit all your questions on our Community Chat in the #chat channel. Find more details below. December 15th at 4:00PM EST. We’re excited to announce that Storj is one of 20 grant recipients selected by the Utah Governor’s Office of Economic Development (GOED) to help advance our technology development. The funding is part of a grant program hosted by the GOED’s Technology Commercialization and Innovation Program (TCIP). We are extremely honored and grateful to have been accepted into the GOED’s TCIP and selected among more than 180 grant applications! From Storj’s first visit in Utah to growing our team and business in this region, we’ve received nothing but support from the State of Utah. In addition to the financial grant, Storj will now have access to mentorship opportunities and entrepreneurial curriculum that helps further our business. You can find more information on the TCIP grant program and learn about the other grant recipients in an announcement made by the GOED today. This is an exciting way to kick off 2017, and we’re looking forward to what the rest of the year has to offer. Shawn Wilkinson CEO/CTO of Storj Labs Inc.
farmers that are helping us out by sharing their excess storage space. The new formula can be found on our GitHub. We want the process to be transparent for everyone to see. There are no rewards for storing less than 1 GB for the month. However, if a user has telemetry reports, exchange reports, or downloads they may still receive a reward. There are no rewards if a user has not been seen in the past week. Each component (gigabyte hours, telemetry reports, and downloaded bytes) is scaled so that each metric ends up being a measurement of how far away users are from the mean. Those values are multiplied by certain weights and summed to arrive at a final value. We hope this will make rewards better, transparent, and more fair for a larger number of our supporters. We will continue to streamline the formula as we progress and more farmers join the Storj network. If you have any queries or feedback you are welcome to join the discussion on our community chat at https://community.storj.io. 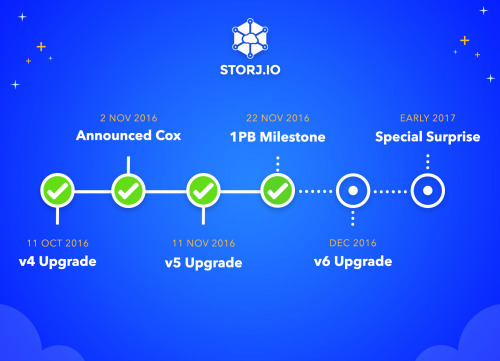 Today we are excited to celebrate an important milestone that supports future innovation for Storj. Storj Labs, the company that develops the open-source network software and provides easy to use tools for the Storj network, has raised $3 million in seed funding. Angel investors from venture capital firms Google Ventures, Qualcomm Ventures and Techstars, as well as industry leaders in the technology security space, including Cockroach Labs, Ionic Security, and Pindrop Security, are among the early backers. Data centers serve as cloud storage hubs for web service giants like Amazon, Microsoft, and Google. But data centers come with a high price tag for developers, providers and users, with an even higher cost associated with data failures and security breaches. From physical servers and networking equipment to other infrastructure demands like electricity, cloud service providers spend billions of dollars every quarter just to maintain or grow their service offerings. 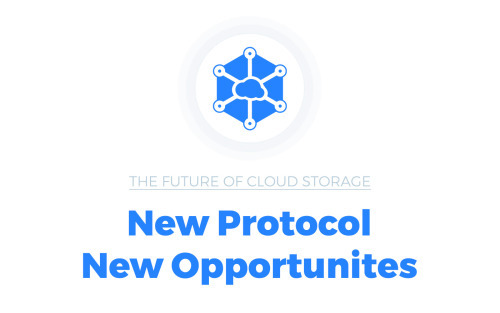 Storj Labs aims to disrupt traditional cloud storage by offering faster speeds, heightened security, better performance, and a more cost effective storage solution. Storj Labs provides easy to use tools so that any developer can use the Storj network, without having to be an expert in distributed networking or encryption. Ease of use allows us to get the Storj network into as many hands as possible without compromising the distributed and decentralized nature of the network. We have surpassed 15,000 API users who leverage the Storj network for secure and decentralized data storage. We are thankful for the continued support of the community, and can’t wait to show off all the new features we have been working on, made possible by this financing. You can read today’s announcement here. Interested in earning money for your extra hard drive space? Become a Storj farmer! For developers looking to join our technical community, we have resources and documentation to help you start contributing. We hope you’ll join us! week, taking down a large percentage of internet services with it. this unfortunate outcome simply should not have been possible. We built Storj because we wanted to create a more robust, distributed system for object storage. After all, the cloud is just someone else’s computer, so why does it have to be Amazon´s? Though there are still some problems to solve to improve security, privacy, durability, and easy of use, Storj is now fully functional: We have resolved all the fundamental problems, while continually optimizing the code to find the best solutions. traditional storage network can offer. 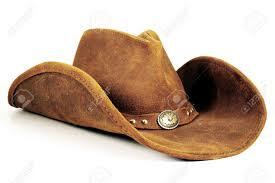 Should our object storage service fail completely, users would still be able to retrieve their data. networks which are located in many different countries, keeping crazy singular failure events from disrupting functionality. The future is bright with innovation, but let’s make sure we build those innovations on platforms that really can’t fail, rather than those that just promise not to. Let´s provide services that don’t cease to function due to a single error, but keep functioning perfectly even when the entire system has failed. This is the promise of decentralized, distributed, and crowd-sourced platforms and one we are turning into reality here at Storj. performance. To start, every registered user can use up 25 GB storage and 25 GB bandwidth (every month!) free for 12 months. What happens when I go over the limit? How much does it cost? Storage is $0.015 per GB per month, and bandwidth is $0.05 per GB. This is about half the cost of competing services, and a large percentage goes directly into the pockets of our farmers. Can I keep using Storj for free? Great question! We just launched our referral program, so you can invite your friends to Storj and get an additional 50GB of storage and 50GB of bandwidth once they join and spend $10. There’s no limit, so invite away! Log in and head to the referrals page. Can I pay in BTC or SJCX? Currently, we don’t have automatic billing options for using cryptocurrencies, but we plan on adding them in the near future. In the meantime, we will manually accept BTC and SJCX payments for large users. Please contact [email protected] for more information. Thanks as always for your continued support, and for making the open source and distributed web possible! The official Counterparty wallet software, Counterwallet, has had no major updates in over two years, and provides a confusing interface for new users. Last year, multisig ceased functioning because Bitcoin made raw multisig transactions non-standard. Tokens in multisig wallets were rendered inaccessible. There is still no concrete migration path for multisig wallets without direct miner intervention. This makes us worried that other features will cease to function in the future. Because Counterparty uses the Bitcoin blockchain for transactions, which is currently having issues with transaction backlog, our users have experienced extremely long transaction times (hours to days). Because Counterparty transactions create small inputs and are heavier than normal BTC transactions, users have experienced extremely high fees for transactions. For the February farmer payout we paid over $1,600 in transaction fees, or about 13% of total payouts. This is not sustainable or scalable. Our work on micropayment channels for Counterparty offers promising routes to addressing the problems above but is unlikely to be broadly useful. Micropayment networks require broad adoption to be effective and secure. It is unclear whether the Counterparty ecosystem can support a robust layer 2 network. The Counterparty ecosystem is small. Very few other organizations are using it at scale. To create our micropayment tools, we’ve had to fund large upgrades to the Counterparty protocol. It’s not sustainable to finance protocol upgrades while also developing our network and products. Development is extremely active. Features are added regularly and bugs are dealt with quickly. Ethereum transactions are usually confirmed in seconds to minutes. Ethereum fees are currently negligible. Future layer 2 solutions like Raiden are promising, and explicitly support ERC20 tokens. The ERC20 standard provides out-of-the-box interoperability with a wide variety of wallets and tools. Ethereum’s smart contract platform can be leveraged to build a more robust and decentralized storage system. Future integration with Ethereum opens exciting opportunities to provide data services to smart contracts and Dapps. We will participate in a larger community of protocol maintainers, sharing the burden of upgrades with many other engaged organizations. In a nutshell, we believe that a simple 1:1 conversion of Counterparty-based SJCX to ERC20 SJCX solves the quality of service issues and allows us to participate in a more active and robust development community. As a result, we will be migrating SJCX to a new Ethereum-based ERC20 token that we feel better serves the Storj ecosystem and its stakeholders. Over the next few weeks I will be working with the community, the team, and the thought leaders to prepare a clear migration plan. As always, the process will be transparent and public. We understand that there will be lots of questions, so please keep an eye on our announcements for drafts and community hangouts to discuss the process and answer questions directly. We believe the technical migration process will be straight-forward. Farmers will use a simple tool to convert their tokens from the old to the new protocol, and then change their payment address in the Storj Share application. We welcome feedback, collaboration, and ideas as we go through this transition. Back in 2014, when the ecosystem was smaller and Storj couldn’t even afford a plane ticket, I drove up to Blacksburg, Virginia with Bo Shen, now founder of VC firm Fenbushi Capital, for a dev retreat. I got the chance to spend a lot of time with Vitalik Buterin, founder of Ethereum, and chat about our crazy idealistic decentralized platforms and where they might lead. A couple of interesting ideas came out of that meeting. First, on the sage advice of Bo Shen, we both participated in each other’s crowdsales. Considering the growth of both tokens, that was a pretty good move. Second, Vitalik wrote a very insightful post about how one might build decentralized storage called Secret Sharing and Erasure Coding: A Guide for the Aspiring Dropbox Decentralizer M of N which I highly recommend reading. Now that we plan on native Ethereum integration, that post is having a lot of impact. Third, I’ve never been that great at statistics, so Vitalik really helped us in the early days with some math that not only showed that decentralized storage is viable, but also that it could be even more durable than traditional centralized cloud storage platforms. Lastly, he left me with a sense that Ethereum was going to be a really strong and useful platform for Storj. Unfortunately, the Ethereum genesis block was created a year after we had a token and the ERC20 standard didn’t exist until late 2015, so there just wasn’t an opportunity to integrate from the start. But we have been watching Ethereum as it grew, successfully overcame The DAO hack, and launched the Ethereum Enterprise Alliance. Ethereum has clearly solidified itself as a great token platform, as well as highlighted some of the awesome advanced features that the blockchain can offer. We are excited for the future, and even more excited for our future with Ethereum. To Vitalik, a personal thanks. To the whole Ethereum ecosystem: it’s time, let’s go and decentralize the data and the world! Storjcoin X - Why Use a Token? Granularity - Bitcoin isn’t divisible enough to support the granularity needed for micropayments. We described this in a blog post back in 2015. Bootstrapping - When we first started the network, Storj was an empty market. No farmers, no renters, and nothing to buy or sell. Storj only works at scale. Using SJCX to bootstrap the Storj network lets us kickstart the system. It helps us identify and fix problems at scale, and paves the way for a larger, more stable network. Flexibility - Technology develops and changes over time. Using our own token allows us to migrate to the accepted standard, without being locked into a particular technology. Stability - Cryptocurrency markets are volatile. A separate token provides a layer of protection from the volatility of larger markets. Volatility is extremely dangerous for long-term storage contracts. All coins rise and sink with the largest markets, but less violently. Incentivization - Our token has been a very important part of incentivizing community members for their hard work, compensating them for performing tasks like tier-one tech support, marketing, documentation, and development. 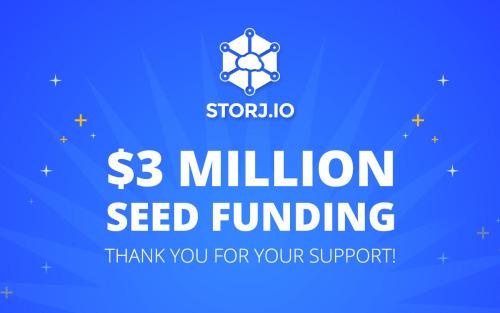 Our early adopters and backers are up 20 times since inception and we love that they have been handsomely rewarded for their contributions to the Storj network. Micropayments - Hub based micropayment networks require the lockup of funds in channels. These hubs can be funded by the network, rather than the operators (who would require high fees to maintain those payment hubs). This will allow transactions to be quick and only require low transaction fees for the users. Currency - As we grow, we are interested in supporting the broader [ethereum] ecosystem and building long-lasting partnerships. Having our own funding mechanism to align interests and goals will give our strategic partners additional flexibility. Ecosystem - Our token allows for a positive feedback loop inside of the Storj ecosystem. Farmers can earn the token for sharing their disk space, and then use it for renting data storage services themselves*. Future - We plan to use the token in ways raw Bitcoin or Ether can’t be used. For example, the Storj-specific signaling described in SIP0002. We designed Storj to be flexible and modular. The whitepaper says this up front: “Storj is payment agnostic. Neither the protocol nor the contract requires a specific payment system.” However, we believe that using a token is the best payment system for the foreseeable future. We believe that the future is a vibrant ecosystem of many tokens, and we look forward to being part of it. manually (just send us an email). Three years ago we won a hackathon, threw together a website, and set out to change the way the world interacts with data. Since then we’ve accomplished much of our original vision. Supported by our community, we’ve built a decentralized storage network of thousands of farmers, expanding further everyday. We’ve grown to employ over a dozen people, opened a second office, and learned a lot of hard lessons along the way to building the world’s largest distributed cloud storage platform. Now, we can take a deep breath and consider the future of Storj over the next three years. Cloud storage is broken. Excessive centralization has created systemic problems and a large portion of the world’s data is now subject to the risk of the “Big Three” (AWS, Microsoft Azure, and Google Cloud Platforms). Cloud storage is not private. The “cloud” is just a collection of other people’s computers and more often than not, the data stored on these services is not encrypted and is routinely hacked. We are passionate about decentralization, and we love free and open-source software. Our mission is to rethink cloud storage, to provide the security, privacy, and transparency it’s missing. That’s why we have built an open-source, distributed cloud platform that aims to fundamentally change the way people and devices own data. Three weeks ago we announced our migration from Counterparty to the Ethereum platform. When we first considered making the move, we were primarily concerned with providing an improved user experience via access to better wallets and tools. As we explored the idea, we realized that Ethereum’s smart contracts and other advanced features could be used to shore up our weaknesses and augment our strengths. Today we’d like to talk a bit about our plans for the future of Storj. Dead Simple File Storage - Hundreds of people have requested this, and we’re excited to make this dream come true. For the past several months we’ve been working with a partner with a massive install base to create a graphical user interface for Storj. We expect to announce this partnership very soon. More User and Developer Tools - We started off planning to build a decentralized Dropbox, but since then our ambitions have grown. Instead of targeting a specific application, we decided to construct the foundation layer beneath them all. The result is a production-ready cloud object store. We’ve already created native and in-browser tools to store and retrieve files. As we continue to build more tools to support more use cases, we plan to reach the goal of thousands ofintercompatible file storage appsinteracting as equals in the Storj network. Smart Contract Integrations - When we started building Storj, smart contracts were just an idea. They are now a powerful tool for the management of distributed systems but present us with a number of difficult performance tradeoffs. Blockchain-based smart contracts cannot manage distributed storage at scale by themselves, but used in conjunction with the Bridge model they become quite compelling. In the future, Storj will add smart-contract layers for audit verification. We’re also exploring on-chain structures that will allow the next generation of applications on Ethereum to use Storj as a native data layer, as well as smart-contract enabled economic reputation and bonding systems. Federated Bridges - Storj Bridges provide a set of decentralized access points to the network. Each Bridge helps manage the state of files that are uploaded. This binds clients to specific Bridges. To alleviate this drawback, in the future Storj will take advantage of audit-verification smart contracts to create a federated file management system distributed across a group of Bridges. This will allow clients and applications to use any Bridge rather than relying on a specific one. Micropayments - As the number of transactions to farmers increase on the network, we will need to implement real-time payments with micropayment channels. The Raiden Network is leading the charge in the Ethereum ecosystem, and we plan to work closely with this project to create practical payment channels that will benefit the entire community. Community Collaboration - As part of the upcoming migration plan, we want to create a better balance between the Storj Community and Storj Labs. First, we will be releasing a solution to solve the token supply imbalance. Second, over the next few months we will be working with community leaders to build processes and tools that will help the community self-organize and have more direct access to resources to build cool and useful things likedocumentation and apps. We would like to thank you for your support over the past few years. You’ve helped us take this crazy idea and turn it into the world’s largest distributed cloud storage network. We’ve come a long way together, and we are excited to continue on this journey with you! We have an exciting integration in the works, and with any luck, we’ll need to find more farmers to keep up with the greater demand. The development team is working long nights and weekends to create the tools and protocol upgrades necessary to handle the expected increase in demand. In the meantime, it’s time to release our plans for migrating the SJCX token from the Counterparty to Ethereum’s ERC20 standard. This article serves as part two of “SJCX Transparency Plan Pt.1,” as it describes the next steps we will take to implement a fair and transparent plan for SJCX. We have been collaborating with CoinFund, considered the industry leader in crypto-economics, to develop this plan. Over the next few weeks we will provide additional details, and publicly release much of the data and information we used to create this plan. Our new Ethereum token will be created via a standard ERC20 contract. This contract will be reviewed by independent auditors several weeks in advance of the conversion period, and the full code of the contract and webapp will be released under a free software license. Existing SJCX tokens will be migrated from Counterparty to the Ethereum platform via a web app. Users will generate a new Ethereum address via a supported wallet of their choice, and submit that address via the web app. The application will generate a new Counterparty deposit address. Users will then send their old SJCX tokens to the deposit address, and the web app will issue an equal amount of new tokens to the user’s Ethereum address. The old SJCX will then be burned. Note: We are working on the migration process with exchanges, but recommend users take control of their own funds and migration process for safety. The webapp will be be released on June 20 and available for at least 90 days. The non-technical properties of the token will remain the same. The total supply of the token will remain fixed at 500,000,000, and all SJCX tokens will be convertible on a one-to-one basis. Storj Share, Bridge, and the protocol standard will be updated to require new payout addresses. We expect to have this migration completed within the token migration period. To minimize risk, Storj Labs will migrate its token holdings via a separate mechanism. Rather than being issued via the webapp, the tokens will be verifiably burned first, and the total converted will be written directly into the new ERC20 smart contract. We have been working with CoinFund to design a fair, transparent way to address the large volume of tokens held by the company. We’ve developed a plan that takes a few big steps in that direction. As part of this plan, before the Token Migration, we will be doing a Token Sale. At the same time, we will place the majority of tokens held by the company in a time-locked smart contract, rendering them provably inaccessible. We are also exploring proposals to burn a number of these tokens. Analyst predictions estimate the cloud storage market could surpass $65 billion by 2020 (source: MarketsandMarkets Research). Now that we have a fully functional distributed and decentralized cloud storage platform, we believe this will give us the means to tackle this massive market head-on by building more tools and integrations. Our high level roadmap was described in the previous post. As always, we intend to be open about the tokens held by the company. We will be publicly discussing the process that led us to these decisions. The total supply of tokens will not increase. 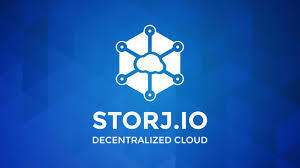 Proceeds from the sale will be used to finance continued development of the Storj network and related tools and services. This token sale will open on Friday, May 19th, and close 1 month later. Tokens will be priced relative to the active market. Additional details and exact terms will follow. As always, thanks for your support! We are all excited to see what the future holds. Update 1: The community has asked us to prepare some models around distribution. We will begin working on that. Update 2: Previously we stated “30 day volume-weighted average price as of April 19th.” Based on community feedback, we will choose a price closer to the spot price to be more fair to existing token holders. The Storj community’s most requested feature has been a drag and drop tool to use the Storj network easily. Your request has not gone unheard. Over the last eight months, we’ve been working closely with the FileZilla team to provide a graphical user interface for storing files on the Storj network. This has included building a C library called libstorj that can be integrated into applications such as FileZilla. While we have already worked with a small group of beta testers up to now, we’re now ready to invite the greater community to help test for high reliability and scalability of the Storj network and Bridge with FileZilla. To join our group of beta testers, please join our community chat and ask a moderator to be added to the FileZilla test group channel. Your feedback will allow us to make significant improvements to the Storj network, Bridge service, and the FileZilla integration itself. We are still in the early stages of testing, but once that is complete the integration will ship as a promoted feature within FileZilla. 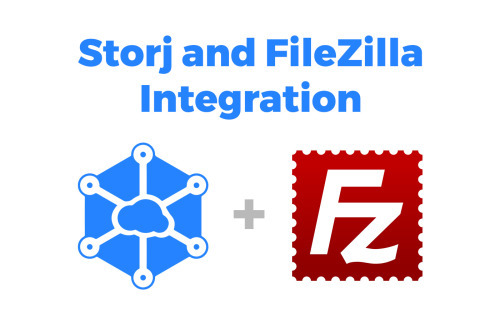 This integration gives existing FileZilla users the option to leverage Storj for a more secure, cost-effective and flexible storage solution compared to cloud providers like Amazon, making privacy and security the default. When this integration goes live, Storj will be available to 15 million monthly users. We are excited to announce this partnership and integration. We are looking forward to the community’s help and feedback on making it even better. Launched more than a decade ago as a high school computer science project, FileZilla has since grown to become one of the most popular open source FTP clients available with more than 100 million downloads per year. A free and open source solution with cross-platform support – available for Windows, Mac and Linux users – FileZilla is known as a fast, full-featured and reliable FTP client that continues to add new features and enhancements for users. We are actively monitoring the possible Bitcoin fork or coin split and anticipating any downstream effects to the Storj ecosystem should it occur. Some of the potential outcomes will cause the application that converts SJCX into STORJ to temporarily go offline. This is expected and should not be a cause for alarm. In the event it is necessary, Storj Labs will announce ahead of time its plan to take the converter application down. We understand that many of our users are still in the process of converting their Bitcoin based SJCX Counterparty token to the Ethereum based STORJ ERC20 token. As such, any major changes to the Bitcoin protocol will inevitably affect users with any remaining unconverted SJCX. Please note that if you have already converted your SJCX to STORJ, this issue does not affect you. If you haven’t, then we urge you to do so as soon as possible to avoid any possible delays should the converter application be offline for an extended time period. Also, it may become difficult for our users to make payments for storage in Bitcoin, though our other payment options won’t be affected. Please be especially alert to these measures potentially being implemented starting on or after July 31st, 2017. You can monitor the current status of the converter app, billing and the other services Storj offers at https://status.storj.io and follow our Twitter for the latest updates from Storj Labs. Feel free to contact us by email at [email protected] if you have any further questions or concerns.